To Cite: Kim S H, Seon H J, Choi Y, Song S. Spontaneous Hemothorax Caused by a Ruptured Atypical Carcinoid Tumor: A Very Rare Case, Iran J Radiol. 2017 ; 14(2):e34650. doi: 10.5812/iranjradiol.34650. Neoplasm is one of the primary causes of spontaneous hemothorax. When spontaneous hemothorax is present, it is essential to detect the surgically corrective cause in order to successfully control this life-threatening condition. Undergoing an imaging evaluation, such as by enhanced computed tomography (CT), is especially important in a patient with spontaneous hemothorax. Herein, we report on a case of spontaneous hemothorax that was caused by a ruptured atypical carcinoid tumor in the right lower lobe. This hypervascular and peripherally located tumor was initially missed by both an unenhanced and enhanced chest CT because intra-tumoral bleeding and the hypervascular nature of this tumor caused similar high density when compared to the loculated hemothorax along the right major fissure and the surrounding atelectatic lung. Consequently, the tumor was obscured by the massive hemothorax and surrounding atelectatic lung on the initial chest CT. However, a second chest CT taken after tube drainage of the massive hemothorax informed the correct diagnosis. Spontaneous hemothorax is an uncommon, but life-threatening, condition and is the most common cause of hemothorax (1, 2). Determining the surgically corrective cause of spontaneous hemothorax through clinico-radiological evaluation is very important among the various etiologies of spontaneous hemothorax that include malignancies, anticoagulant medication, arteriovenous malformations (AVMs), endometriosis, pulmonary infarctions, adhesions with pneumothorax, and hematologic abnormalities (1, 2). Neoplasm is very rarely the cause of spontaneous hemothorax and so it can be considered last among the many possibilities. A few cases of pulmonary, mediastinal, and intra-abdominal neoplasms presenting with a hemothorax have been reported, including angiosarcoma, hepatocellular carcinoma, germ cell tumor, pulmonary choriocarcinoma, and lung cancer (1, 3-8). Primary lung malignancy is an extremely rare cause of spontaneous hemothorax (3, 4, 9). To our knowledge, this is the first reported case of bronchial carcinoid tumor-associated spontaneous hemothorax in the English-language medical literature. Herein, we discuss the diagnosis of this rare condition and present a review of the literature. A 74-year-old woman was admitted to the hospital due to the sudden onset of right chest pain and blood tinged sputum. She had no history of trauma or other underlying disease, except hypertension. Laboratory tests revealed low hemoglobin (8.8 g/dL; normal range, 12 ∼ 18 g/dL) and low hematocrit 23.7% (normal range, 37 ∼ 52%) with a white blood cell count (6.79 × 103/μL; normal range, 4.2 ∼ 6.1 × 103/μL) and platelet count (22 × 104/μL; normal range, 13 ∼ 45 × 104/μL) within the normal ranges. An initial chest radiograph showed right-sided pleural fluid collection (Figure 1) so she underwent chest computed tomography (CT). Those scans revealed a moderate amount of hyperdense pleural fluid that had collected in the right hemithorax, which is indicative of hemothorax (Figure 2). However, the exact cause of the spontaneous hemothorax was not detected by the initial chest CT since there was no detectable cardiovascular problem or leakage of the contrast medium. A small nodule was hidden in the atelectatic right lower lobe (RLL). Surrounding atelectatic lung and fissural loculated hemothorax hampered detection of the nodule because intra-tumoral bleeding and the hypervascular nature of this tumor caused similar high density as the loculated hemothorax along the right major fissure in both the unenhanced and enhanced CT scans. Figure 1. A 74-year-old woman with sudden onset of right chest pain and blood tinged sputum. Chest radiography showing right pleural effusion (arrows). Figure 2. Unenhanced (A and B), contrast-enhanced (C and D), lung window (E) and additional coronal reformatted image (F) of initial chest CT. There is high attenuated effusion (the mean attenuation value is 34) in the right hemothorax (arrows in A and C) with loculated hemothorax along the right major fissure (asterisk in B, D and E). A hyperattenuated nodule about 2.5 cm in size is hidden in the atelectatic right lower lobe (RLL), which is suggestive of intratumoral hemorrhage on the pre-enhanced CT (arrowheads in B). This nodule shows a partially enhanced area (white arrowheads in D) mixed with hemorrhage on the contrast enhanced CT, which is suggestive of its hypervascularity. E, On the lung window image the peripheral nodule (white arrowheads) is also hidden in the passively atelectatic RLL where crowding of pulmonary vessels (black arrowheads) and few air bronchograms (arrowheads) are shown; F, On the coronal reformatted image, the peripheral nodule (white arrowheads) is also imbedded in the atelectatic RLL where the internal air bronchograms (arrows) are abruptly cut off around the loculated hemothorax along the right major fissure. The loculated hemothorax along the right major fissure is better demarcated on this reformatted image (black arrowheads). A tube thoracostomy was done to drain the right hemothorax. About 100 mL of bloody pleural fluid was aspirated from the patient. For the evaluation and treatment of hemoptysis, a bronchoscopy was performed. It revealed active bleeding in the RLL bronchus while she was coughing, but no obstructive endobronchial lesion was detected. 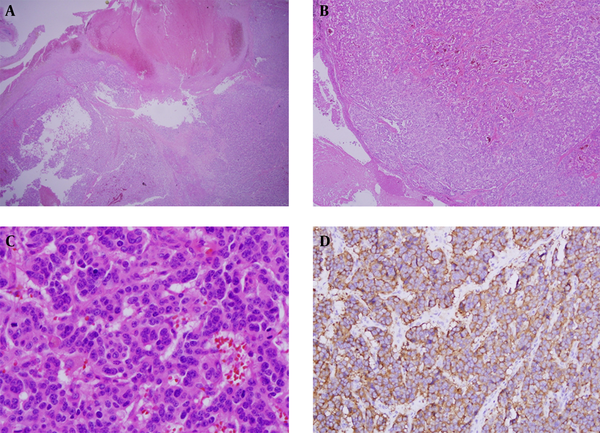 A blind transbronchial lung biopsy targeted for RLL revealed a neuroendocrine tumor that was pathologically indicative of a carcinoid tumor. The patient then underwent a preoperative chest CT scan four weeks later for the evaluation of a pathologically confirmed carcinoid tumor in RLL. After a near-complete improvement of the passive atelectasis in the RLL and right hemothorax, a 2.5 cm, highly enhancing nodule, abutting the right major fissure in the right anterior basal lung, and mixed with the remaining localized hematoma along the adjacent right major fissure was clearly demonstrated (Figure 3). 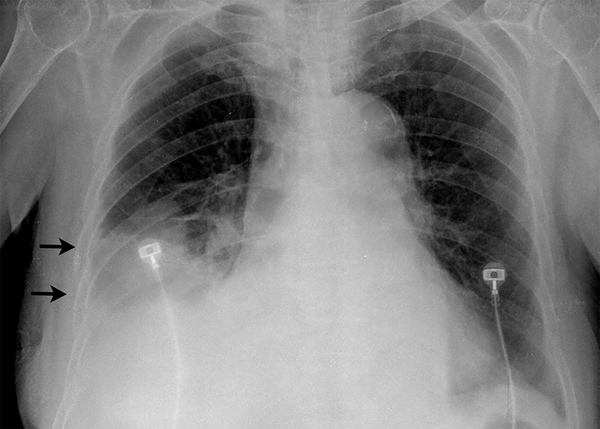 This loculated hemothorax along the right major fissure persisted in serial follow-up chest radiograms during the period of admission without any periods of improvement (not shown). The patient underwent a RLL lobectomy. Pathologic results showed an atypical carcinoid tumor (Figure 4) mixed with surrounding hematoma. The final diagnosis was pulmonary atypical carcinoid tumor-associated right hemothorax. Figure 3. A and B, Contrast-enhanced; and C, Lung window images of follow-up chest CT. After near-complete improvement of passive atelectasis in the RLL and right hemothorax, a 2.5 cm, highly enhancing nodule in the right anterior basal lung (white arrows in A and B) is clearly demonstrated, mixed with remaining localized hematoma along the adjacent right major fissure (arrowheads heads in A, B, and C) which showed high attenuation (the mean attenuation value is 50) on unenhanced images of the follow-up chest CT (not shown). A continuous low attenuation from the visceral pleural space to the peripheral enhancing nodule (black arrow in B) is evident. C, On the lung window image, the peripheral nodule (asterisk), which is surrounded by patent air bronchograms (arrows), is more clearly demonstrated. There is no demonstrable endobronchial portion of the nodule. Figure 4. Microscopic findings; A, The solid tumor had a hemorrhagic portion (Hematoxylin-Eosin stain, original magnification ×20); B, The tumor was located beneath the bronchus; the tumor showed a diffuse and cord-like growth pattern (Hematoxylin-Eosin stain, original magnification ×40); C, The tumor cells showed a round uniform shape and fine chromatin (Hematoxylin-Eosin stain, original magnification ×200); D, The tumor cells were immunoreactive for CD56 (original magnification ×200). Spontaneous hemothorax is a subcategory of hemothorax that involves the accumulation of blood within the pleural space in the absence of trauma or other causes (2). Only a few reported cases of primary lung malignancy induced spontaneous hemothorax have been described (3, 4). Lung cancer is a very rare cause of hemothorax, even in the setting of pleural extension (1). Furthermore, bronchial carcinoid tumor-related spontaneous hemothorax has never been reported in the English literature to our knowledge, although there are reported cases of bronchial carcinoid associated spontaneous pneumothorax (10, 11). Bronchial carcinoids belong to a broad spectrum of neuroendocrine tumors including typical carcinoid (TC) and atypical carcinoid (AC) tumors, large-cell neuroendocrine tumors and small-cell lung cancer (12). TCs and ACs are low- and intermediate-grade, respectively (12), and have similar gross pathologic and radiologic features that are largely dependent on tumor location. ACs are more aggressive than TCs (13). Bronchial obstruction-related symptoms, such as recurrent obstructive pneumonitis/atelectasis and chest pain, are the most common symptoms of carcinoid tumors, followed by cough and hemoptysis with evidence of a bronchial obstructing lesion in the majority of patients (13, 14). Pulmonary neoplasms associated with spontaneous pneumothorax sometimes cause spontaneous hemothorax due to torn adhesions. However, lung tumor-related spontaneous hemothorax without pneumothorax is extremely rare (9). The mechanisms of tumor-related hemothorax without pneumothorax are explained as the compression and ischemic necrosis of pleural and pulmonary tissue, invasion of the pulmonary vessels by the tumor, or tumor rupture into the pleural cavity (9). A bronchial carcinoid tumor associated with hemothorax has never been reported, even though its hypervascular nature with hemoptysis is a common symptom (13). Radiologically, a bronchial carcinoid tumor usually presents as a centrally located, well-defined hypervascular tumor with a typical iceberg sign (a small endobronchial portion and a large exobronchial portion) that appears on enhanced chest CT. These typical chest CT findings help in the imaging diagnosis of bronchial carcinoid tumors (13). Although it has a hypervascular nature and commonly causes hemoptysis, we can assume that a centrally located tumor with well-defined margins, indicating a less invasive nature, would only rarely cause spontaneous hemothorax. Seldom do peripherally located carcinoid tumors present as solitary pulmonary nodules. Furthermore, ACs have certain features suggesting a more aggressive nature (13). Therefore, a peripherally located AC has the potential to present a spontaneous hemothorax, not act as an obstructing symptom, as in our case. 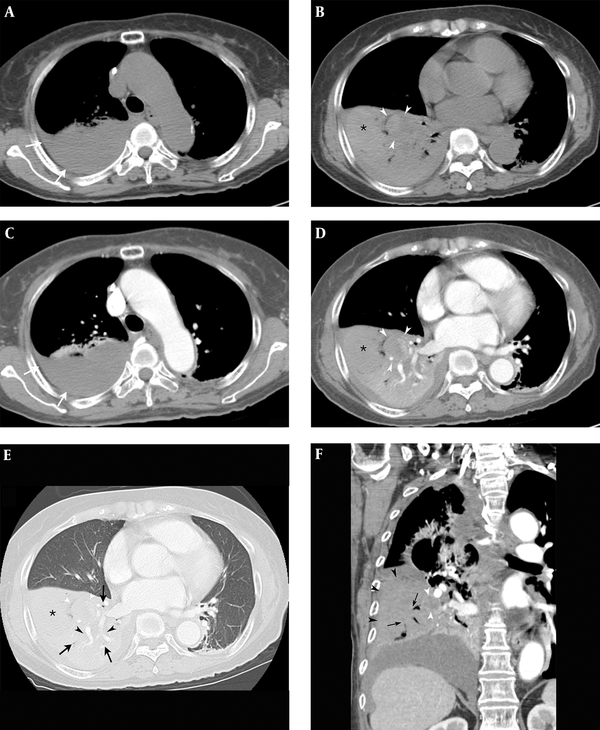 The mechanism of AC-related spontaneous hemothorax was not determined in the present case through pathologic features including visible ischemic necrosis or pulmonary vascular invasion. However, observations of copious aggregation of red blood cells around the tumor margin abutting the visceral pleura on the pathologic specimen and high attenuation of the peripheral nodule on the unenhanced CT suggested intra-tumoral hemorrhage. Furthermore, the CT findings of the subfissural location of the tumor abutting the right major fissure, persistent loculated hemothorax along the right major fissure, and continuous low attenuation from visceral pleural space to the peripheral enhancing nodule suggest that the spontaneous hemothorax associated with peripheral AC in our case involved a rupture of this hypervascular tumor into the adjacent visceral pleural space. These rare findings for bronchial carcinoid tumors make radiological diagnosis difficult. Furthermore, the adjacent loculated hemothorax along the right major fissure obscured the highly attenuated pulmonary tumor on the unenhanced CT images due to intratumoral hemorrhage, and enhanced surrounding atelectatic lung also obscured the hyper-enhanced pulmonary tumor on the enhanced CT images of the initial chest CT. However, on the follow-up chest CT scan after tube drainage of the hemothorax, a hypervascular SPN was clearly demonstrated in the peripheral lung of the right lower lobe. Therefore, a second-look chest CT after drainage of the hemothorax with improvement of atelectasis may facilitate imaging diagnosis of peripheral SPN as a cause of spontaneous hemothorax. The prognosis for malignancy-associated hemothorax remains poor (1). However, patients with bronchial carcinoid tumors have a high life expectancy. Lobectomy is the most common procedure for the treatment of bronchial carcinoid tumors due to their metastatic potential, regardless of their size or location (12). 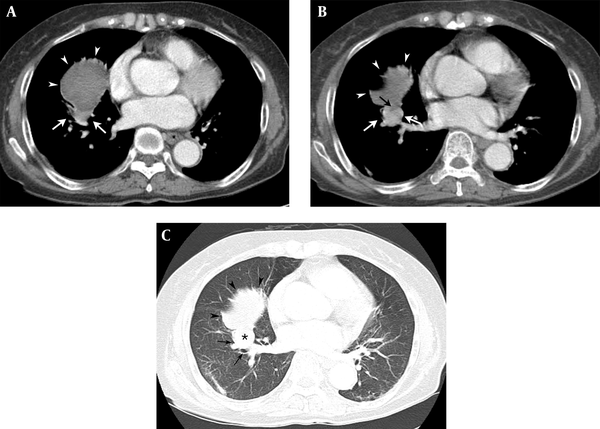 Our case highlights the possibility of delayed diagnosis of pulmonary neoplasm, especially when it has hypervascularity or is small in size and/or is found in a peripheral location, as a cause of spontaneous hemothorax due to the possible obscuration of SPN by hemothorax and/or atelectatic lung, as well as the tendency to overlook this rare condition. In conclusion, lung cancer-related spontaneous hemothorax is a very rare disease entity. Furthermore, spontaneous hemothorax caused by the rupture of an atypical bronchial carcinoid tumor has never been reported in the literature. Therefore, a second-look chest CT scan after drainage of spontaneous hemothorax is mandatory, especially when there is no detectable cause of the spontaneous hemothorax found when examining the initial image, in order to consider peripheral small pulmonary neoplasm as a possible cause of spontaneous hemothorax. This strategy could improve prognosis of this rare condition through prompt and accurate diagnosis, and consequently optimize the surgical treatment of pulmonary neoplasm. Authors’ Contribution: Soo Hyun Kim prepared the manuscript, literature search, and radiological images. Hyun Ju Seon reviewed and edited the manuscript and radiologic images. Sang-Yun Song operated on the patient and contributed to the conception of the manuscript. Yoo-Duk Choi supervised the pathology and managed the figures. All authors read and approved of the final manuscript. Funding/Support: The authors received no funding or support in connection with this study.